Once I read a quote: „Sometimes you need those bad days, to help you appreciate the good ones.“ When we have a bad day it automatically reflects on our body and skin, particularly on face. 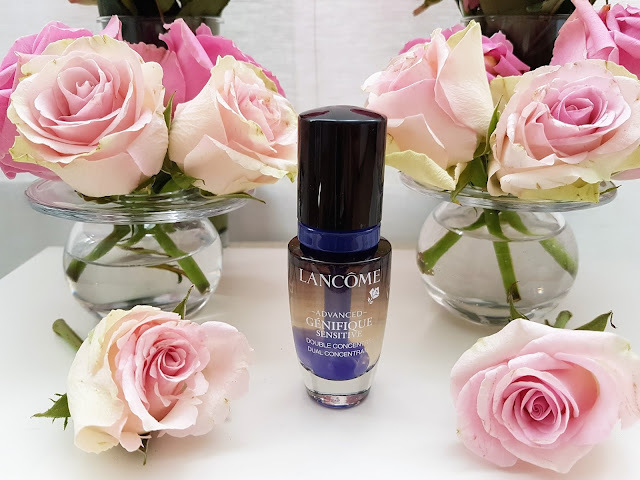 Whatever they mean, there's a solution for bad skin days - Lancôme Advanced Génifique Sensitive Dual Concentrate Serum, a night guardian who bids them bye-bye. No matter how much attention we devout to skin care, bad days are always possible. Today's life style, a variety of external and internal factors such as travel, air-conditioning, seasonal changes, air pollution, late nights, fatigue, stress and hormonal cycles affects the skin and can cause a havoc. All of them, regardless of age and skin type, result in so-called bad skin day. 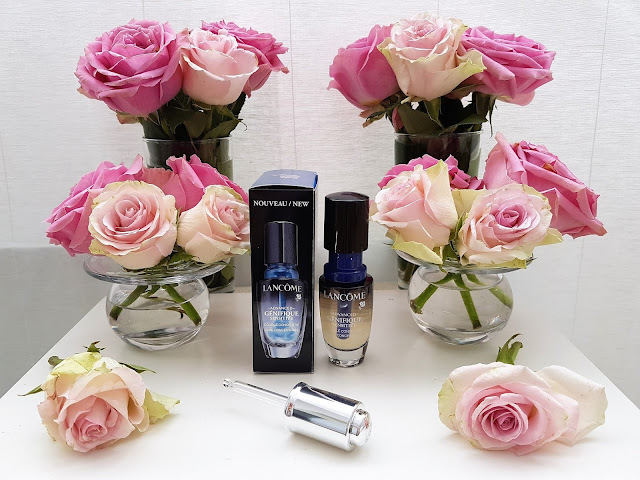 Dual Concentrate serum consists of two parts: Base Concentrate with a probiotic extract that sooths, revives and amplifies skin radiance and Blue Concentrate with antioxidants which protects the skin. 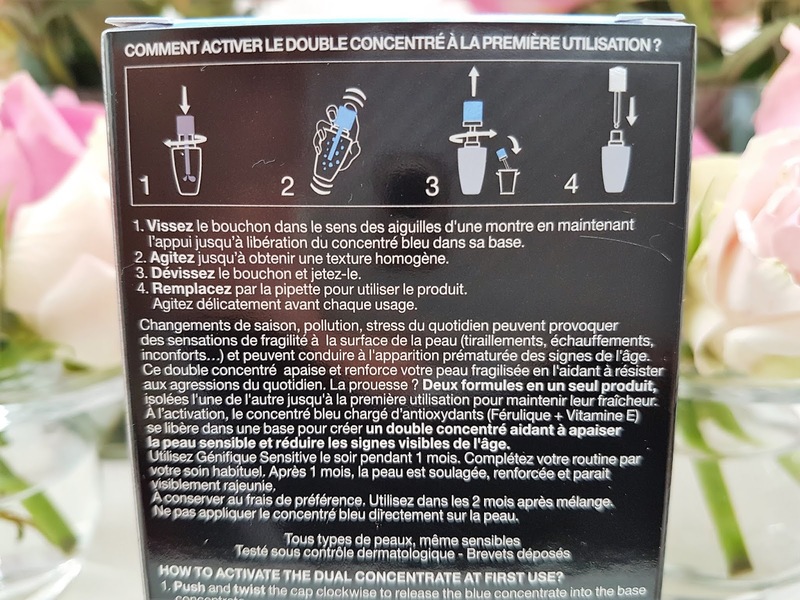 Both come in one vial but are not joined – two formulas need to be freshly mixed before use. We must do it ourselves, by pulling and twisting a cap and release blue into base liquid. It was very interesting to see how blue and transparent concentrates mix together, which reminded me of a blend of painting colors. After the blue fluid pours out of pipette, we give the bottle a quite shake and witness the magic before our eyes: by mutual permeation the blue color gradually disappears and a gray-silver shade becoms visible through the glass. When the two concentrates are evenly mixed, the formulas are transformed into one product – our new night saviour. After the whole procedure the cap with blue concentrate is to be removed and replaced by silver pipette with logo on top, which we will utilize at each subsequent use. The serum comes in wonderful, 20-milliliter black-pellucid bottle with the above mentioned silver pipette. 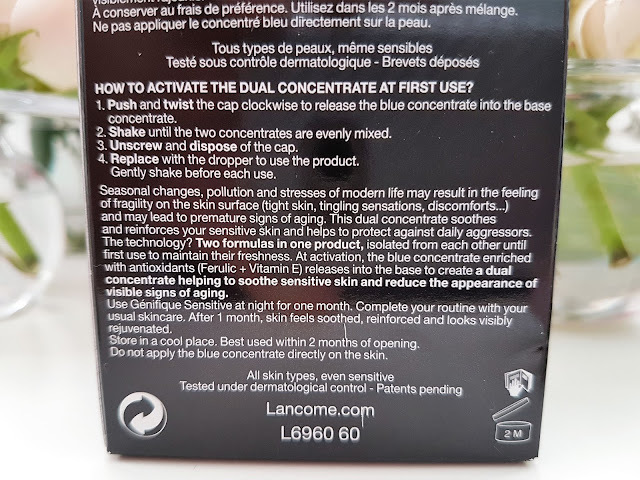 Packaging looks very elegant and proves that in Lancôme thought of it as well, about packing that would be worthy of the quality of product itself. Freshly activated Dual Concentrate will help to soften the skin whenever necessary and, like Advanced Génifique Serum, is enriched with ferment, bifidobacteria and lactobacilli extract, along with ferulic acid and vitamin E. They provide instant comfort and reduce dryness, the skin feels soft, smooth, bright and calm and the bad days become the past! 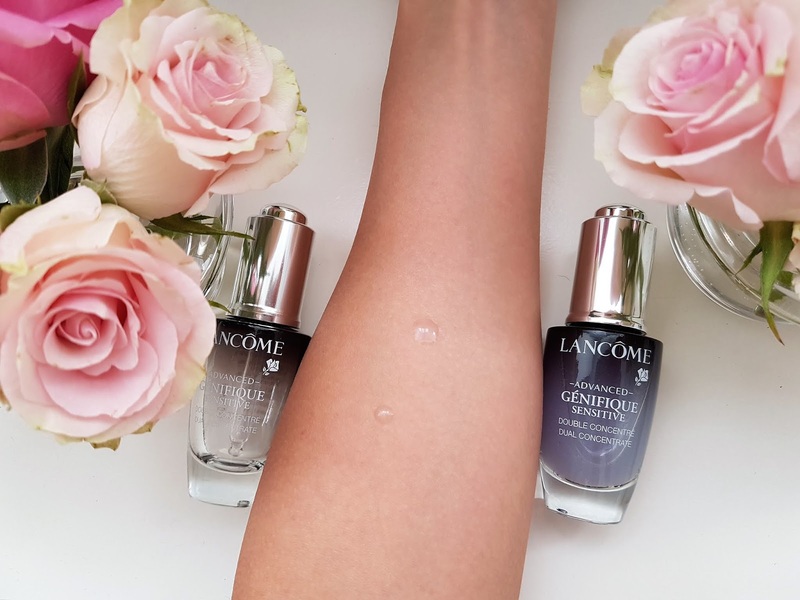 In order to properly connect the ingredients, the bottle needs to be lightly shaken before each use and gray serum on the skin turns translucent, similar to scented drop of water, with the aroma that whiffs away after application, while the texture is fresh, plump and fast absorbing. It's recommendable to use the serum almost every night for a period of 2 months after compounding. Slow consumption is a great advantage, even though I apply it on my face and cleavage area. 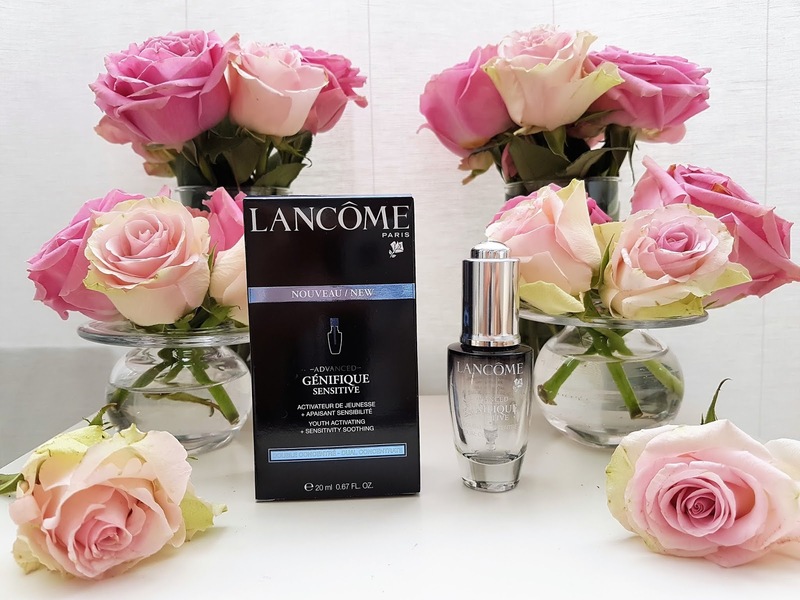 On the official site it's suggested to complete the routine in perfect pair combination of employing Advanced Génifique serum, bestseller that has reached iconic status, in the morning before moisturizing and Advanced Génifique Sensitive over the night. 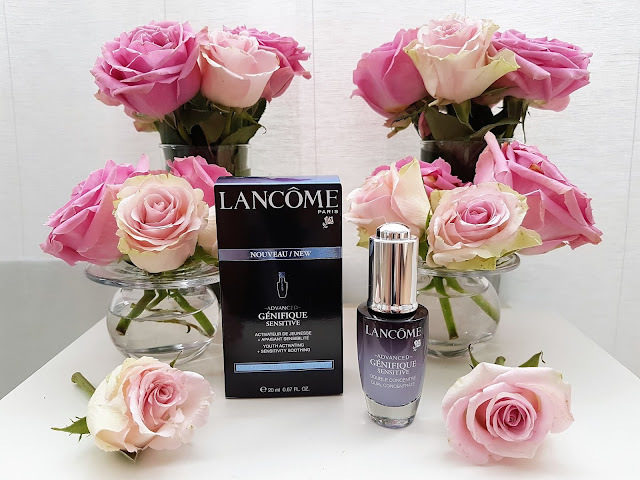 During the day I'm using Lancôme Génifique Crème, a daily hydrating cream that with its velvety formula ensures youthful complexion, softness and vibrant glow. 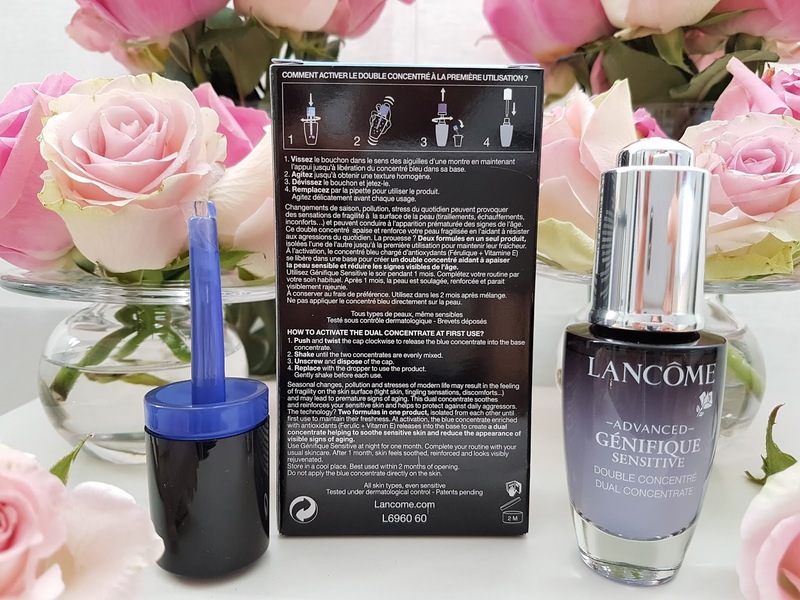 The packaging is identical to that of serum, ie black and silver with limpid lower part. My excitement is adequately expressed in the fact that I depleted all of it so I can't show you the texture, but I would describe it as creamy and gelatinous with quick absorbtion and light coating. As I wrote before, I prefer serums over night creams because of formulas with high concentration of nutrients. I'm more than satisfied with this one and I immediately bought another pack. I apply it as a final step in facial skin care, every night before bedtime, and wake up with fresh, soft and silky skin. I don't just use it on bad days, but constantly, so I can tell that my skin is a stranger to them. Currently I'm not purchasing new Génifique cream as I'm utilizing Dior Hydra Life Sorbet (you can read the review here) and I can confirm that they remarkably complement each other and take ideal care of my skin, which looks better every day. Do you have bad skin days? Which products do you use? Have you tried Lancôme Génifique cream or Advanced Génifique serum? What are your impressions? Please write me in the comments? This quote is so true although fortunately normally my skin is very good. I use serums as well as creams and I would love to win as I want to try out your giveaway! My skin is also very good, but sometimes I have bad days and then this serum saves me. Which serums and creams do you use? Did you try this one? I love that quote and how you related it to our skin because it's so true! No matter how well I take care of my skin I always have bad skin days, and it always makes me appreciate the days when it is good. I've never used this product before, but I find it so interesting that you mix the two parts yourself when you get it. This was such a great review with great details, and I love all of your product photos! Thank you so much, dear Kara for your kind words. 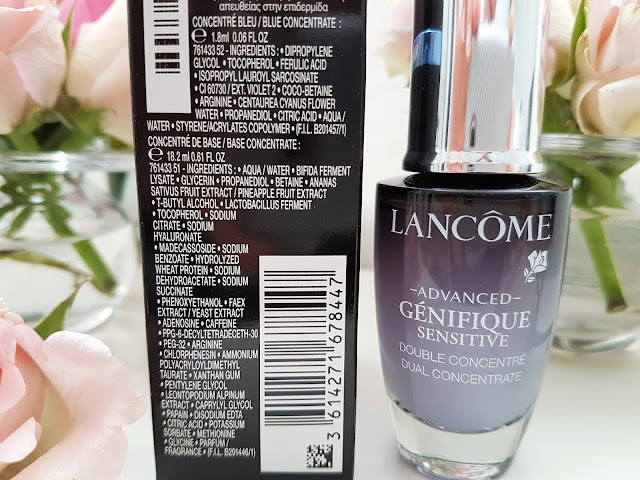 First time when I bought this serum I was surprised when I saw that they are separate and I need mixed it, but now I practiced it and it is very interesting to look how they connected and become one product. If you use this product, let me know your impressions. 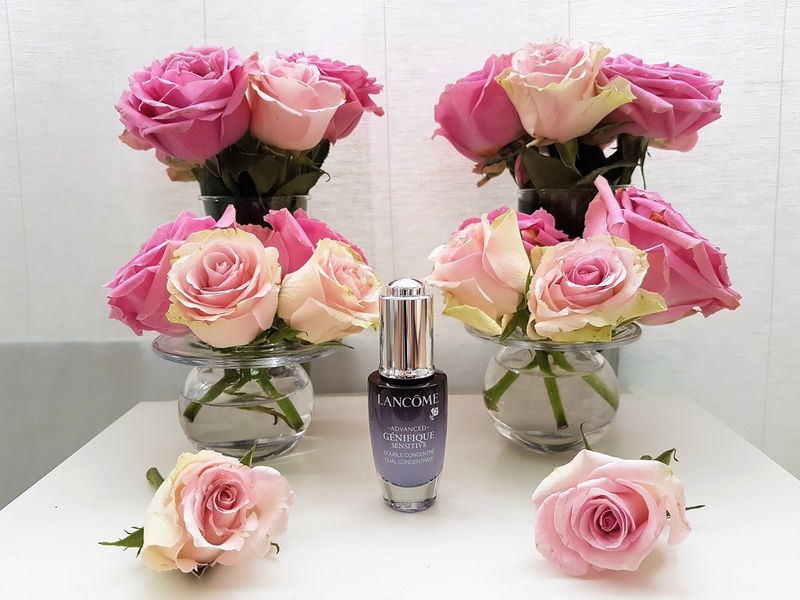 I have never tried Lancom product before, but i have heard that the product is good. 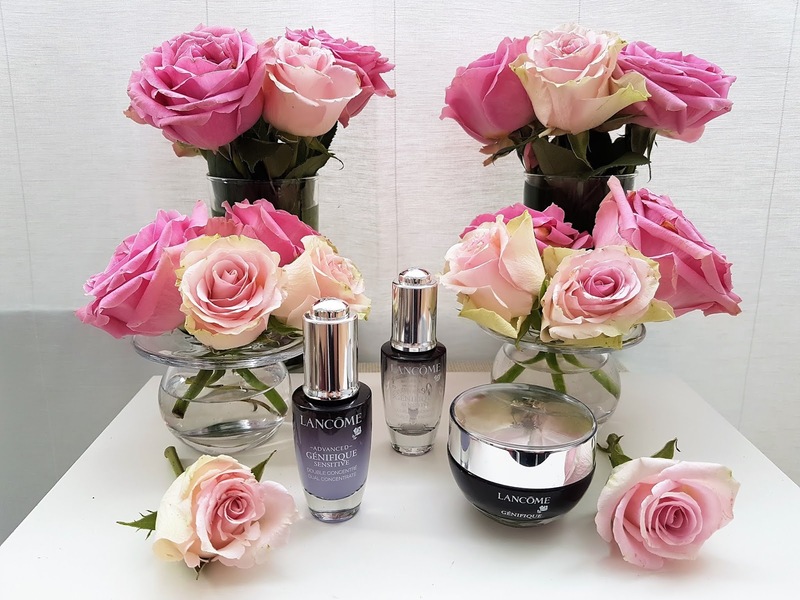 I have few of Lancome products and I'm very satisfied with them. They all do great job and I can highly recommended to you to try it. Packaging is very classy and elegant, while the product inside is awesome. 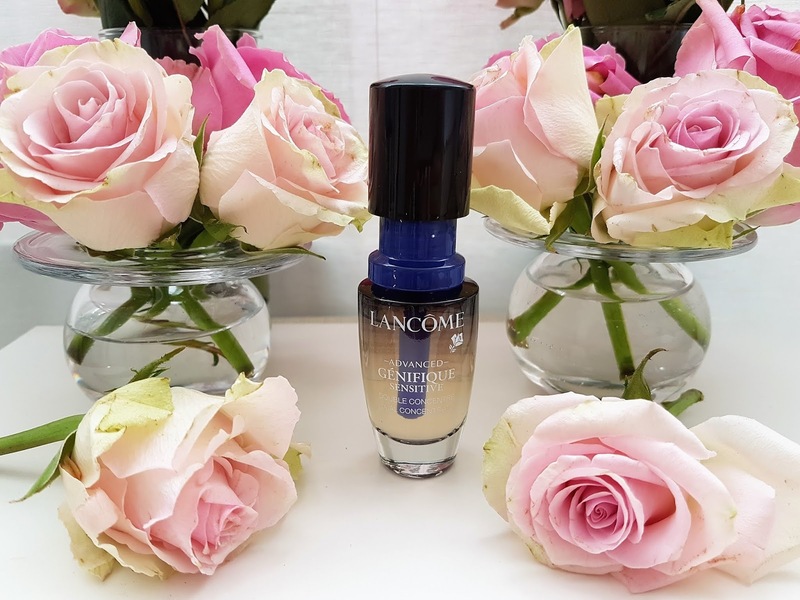 Which Lancome products you have tried? What are your impressions about it? The dual serum sounds so amazing! serum is really amazing! I love it so much! If you try this serum, let me know your impressions! I completely agree with you. The product looks very interesting and do great job in the same time. 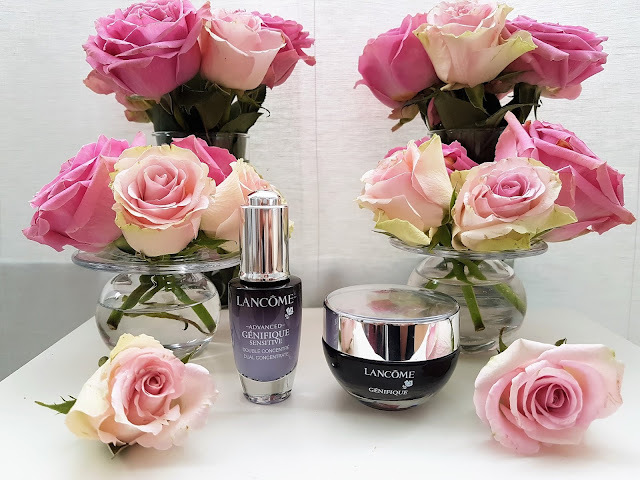 We share the same love because I also love Lancome products! I love how you shot these! the roses compliment the packaging so well! I'm glad to hear that you love combination of roses and products. I'm glad to hear that you like this post! It means a lot to me. Of course, that I will check your latest post! I have used this one and it works quite well! I'm glad to hear that you are also satisfied with this product like I am. this product is really amazing! Thanks for the honest review. Sounds good! thank you for your kind words. It means a lot to me because I try as much as possible describe how amazing this products it is and how much I love it. I'm glad to hear that you discover my blog and you like it. I also really like your blog. We share the same opinion about this product, it is amazing! I'm glad to hear that you like photos! How lovely and luxurious does this look! we share the same opinion about this product! I wish you lovely night! The product must be great! the product is really great and do awesome job. yes, the product is amazing from formula til packaging. Everything is perfect! I don't believe I've tried a skincare product that contained probiotics before, this is so interesting! I'm all for skincare with antioxidants. Thanks for sharing and have a great rest of the week! this serum is great and I really like it. You can ask for tester to try it on your skin, before buy it. But I believe that it can work great job for you, like it works for me. This brand has high quality products, I also prefer seruns to creams I think they are much more enriched in terms of ingredients. Love your flowers. thank you so much! I'm glad to hear that you like flowers and that we share the same opinion about serums. yes, this product is very often in fashion magazines and it is amazing. I wish you nice rest of week! when you try it, let me know your impressions about it! I'm curios do you like it, like I do? thank you so much for your kind words! It means a lot to me. When I write post, I write what I would find and read about some product and I'm glad to hear that you think that it is great and thorough. 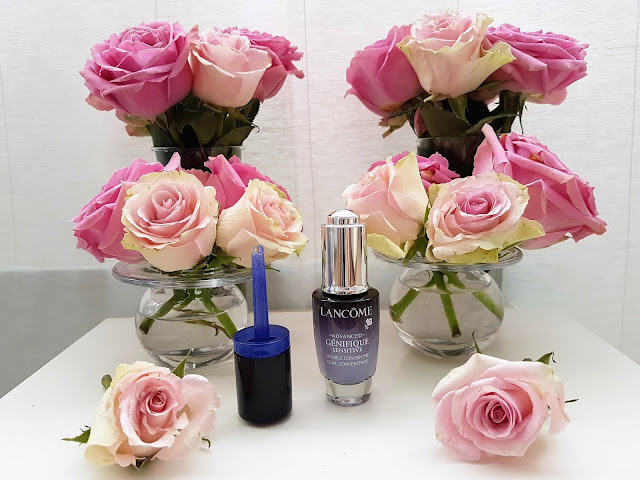 We share the same experience about Lancome products, because no one of products that I have didn't disappoint me. I totally love all Lancome products, and I am sure this is no exception. Will try it out! I can guarantee you that this product isn't exception, because it is great and do awesome job. When you try it, let me know your impressions. thank you so much! I'm really glad to hear that you like it. I wish you lovely rest of week! Hvala ti puno, draga Milice. Mnogo mi znači kada pročitam da ti se sviđaju fotografije i post jer nastojim prenijeti što je moguće više informacije i što detaljnije prikazati proizvod. I ja također ponekad imam loše dane, poslije kojih mi je potrebno neko vrijeme da se koža oporavi, te zbog toga nastojim izbjegavati stres koliko je to moguće i njegovati je što bolje. I was very keen to test, the brand is incredible. Have a great day! when you test this product let me know your impressions. I completely agree with you that brand is incredible and this product is also. 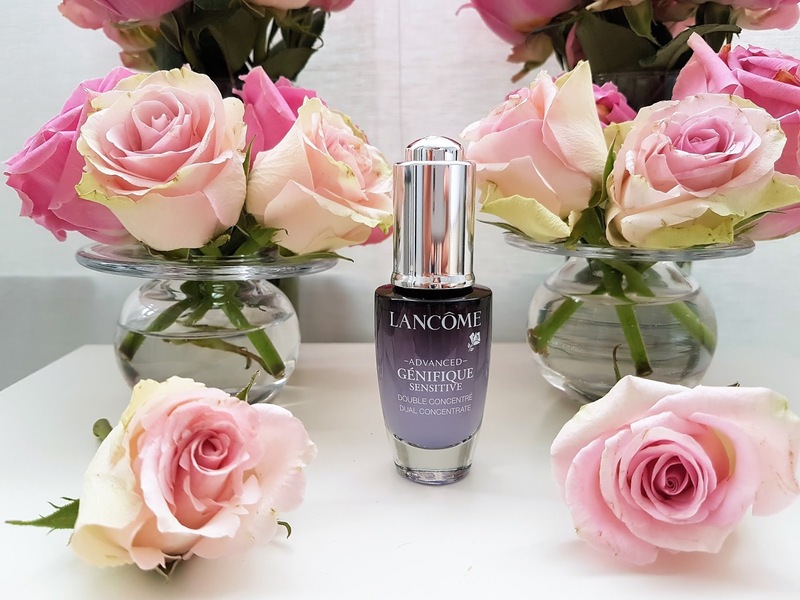 I agree with you about one more perfect product from Lancome. Have a nice rest of week! 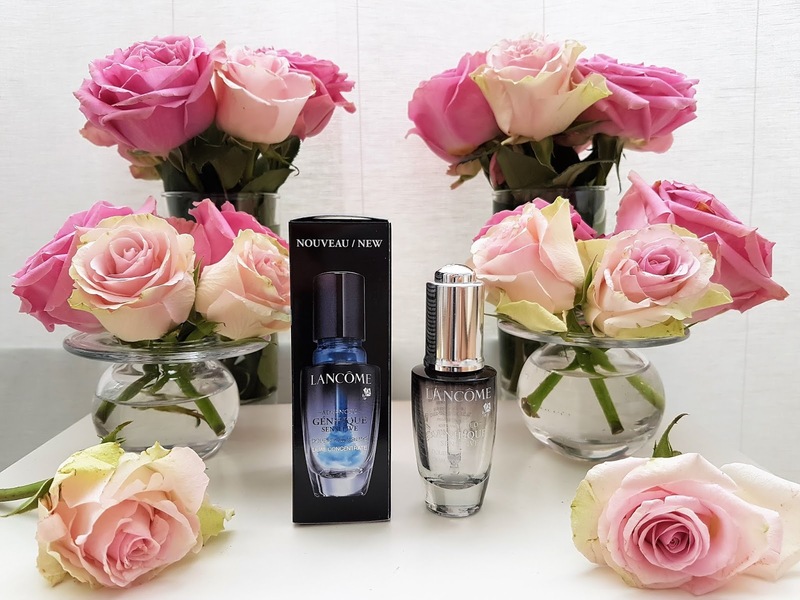 Would love to try this night serum, i've never tried Lancome! 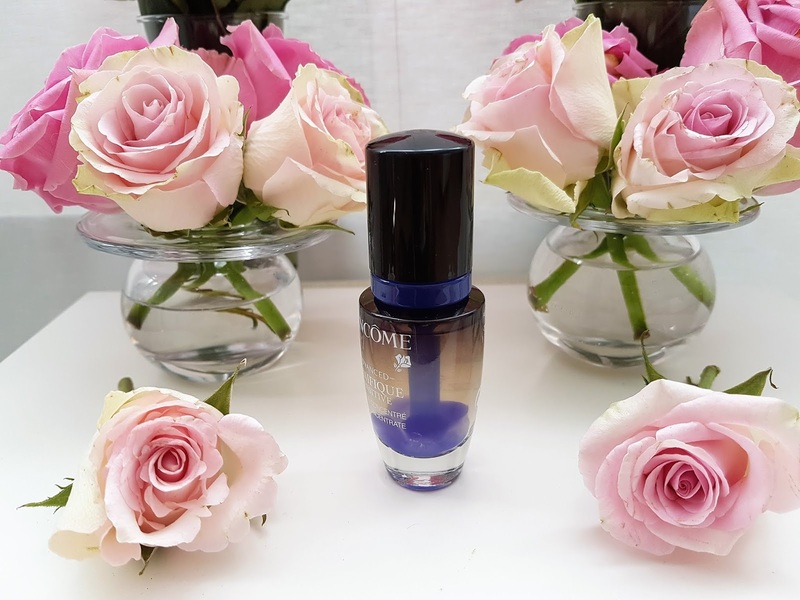 I hope so that you will love this serum as much as I, when you try it. Great post, loving the imagery! I'm glad to hear that you love photos! yes, it is very interesting to mix those two concentrate and make your own product. I also never before seen it until I didn't bought this serum. The week was great, I hope so that you also have amazing week! Great products for a bad day. I completely agree with you about product and packaging! Product is amazing and packaging is gorgeous. I wish you nice weekend! I really like how the packaging looks. I know those bad skin days - something like this would be great! It's so cool to see the colors mixing. Glad you had a good experience from it - thanks for sharing! you are welcome. I'm glad to hear that you like packaging and mix with roses. It mean a lot to me. 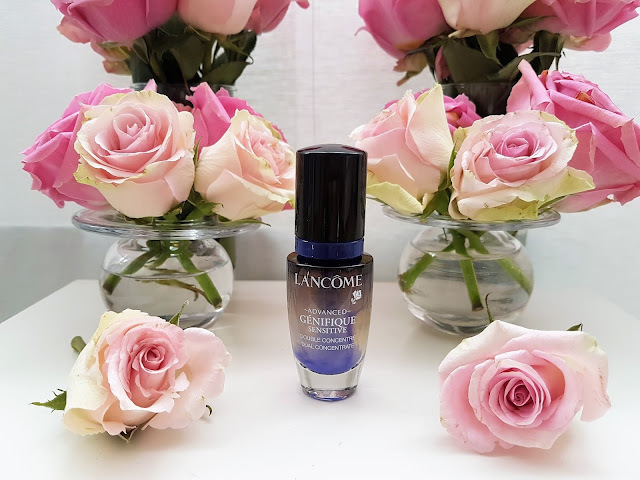 The product is really great and I recommended to you to try it. You can first ask for tester to see how it works on your skin. I'm very happy and satisfied with results which this product left on my skin. I also like Lancome because they have awesome makeup and skin care products! I'm very happy when I read that you like my posts and products that I presented. I also wish you happy weekend! 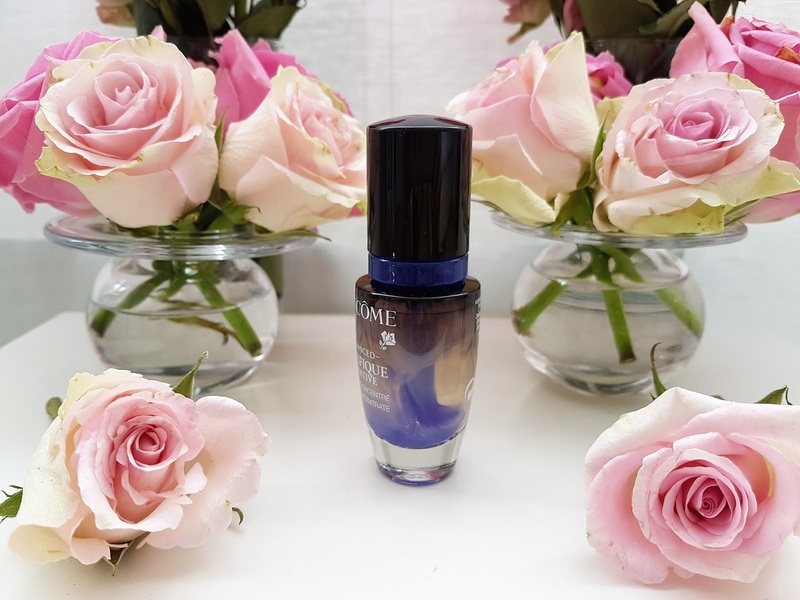 I think that this serum can be perfect for you! You can ask for tester before you buy it! If you start using it, let me know your impressions! Wish you beautiful weekend! I'm glad to hear that you like packaging. Serum is really amazing! This is such a beautifully written post dear and I love how deeply you went into everything talking about the science of the product, life in general, and the world! You really took this to the next level and that makes it really stand out. That quote really stuck with me and I think it's something we should all remind ourselves more of. A quote I read the other day which really stood out to me goes like this, "I didn't loose the gold, I won the silver." I love the idea of the Lancome product how you yourself insert the blue serum into it. I think that is so creative and I will definitely have to check it out! Thank you so much for your comment, dear! It means a lot to me when I read that you like it! I really appreciate it because I want make informative and useful post where readers can find as much as possible information about product! 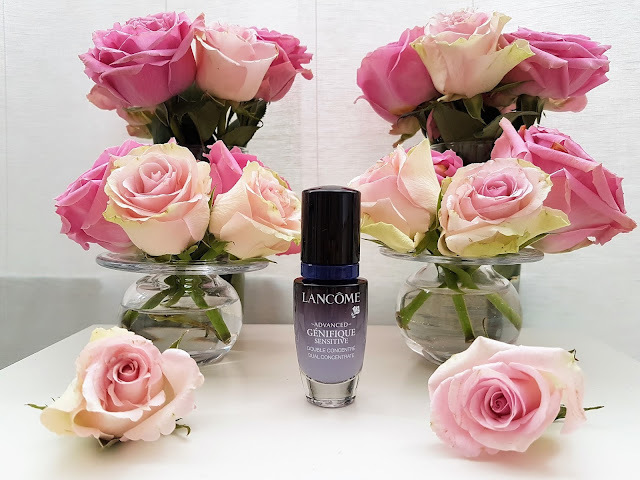 This serum is really great, so when you check it out, let me know your impressions! I've heard some amazing things about this brand. I would love to try their serum. 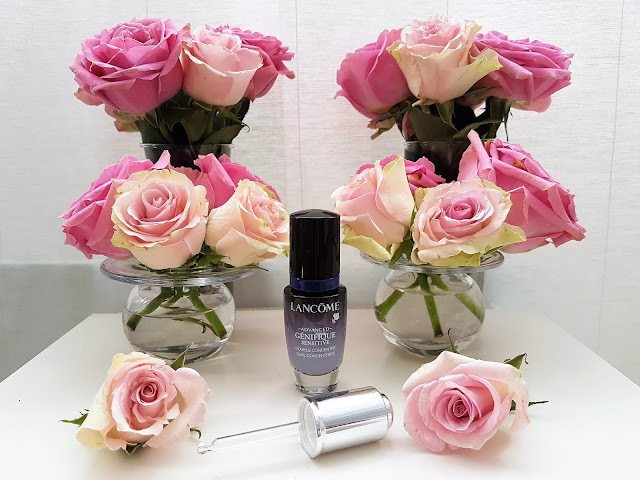 Lancome is amazing brand and they have so many gorgeous and high quality products. If you try this serum let me know your impressions! 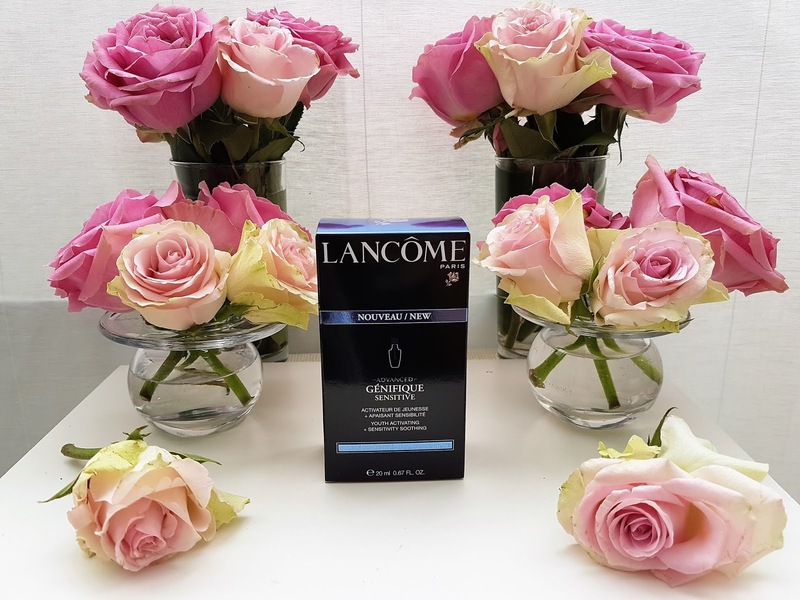 We share the same love, because I also really love Lancome products and use many of them, especially those for skin care. This skin care package looks really amazing, thanks for sharing it. You are welcome. I really like this packaging and product inside is amazing. Such a beautiful piece of jewelry. I find a few pieces for myself. Kod mene se manjak sna i stres baš vidi na koži lica, tako da mislim da bi mi trebao neki ovakav serum. Lijepa prezentacija i opis proizvoda. Hvala ti puno. Drago mi je čuti da ti se sviđa blog post. Ukoliko ti se manjak sna odražava na koži, definitivno probaj ovaj serum jer kako u Lancomu navode ovo je serum namjenjen za "loše dane kože" i iz osobnog iskustva mogu potvrditi da stvarno pomaže jer kožu čini punijom, blistavijom i na površinu izlači njen prirodni sjaj i ljepotu. 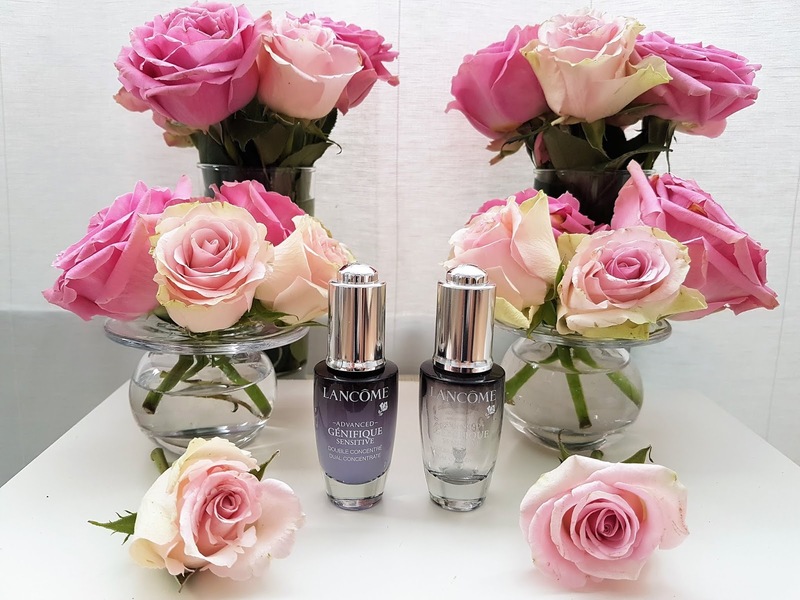 Lancome have amazing skin care and make up products. All of them coming in elegant and beautiful packaging. I try different products and every of them was great for my skin, but I didn't try foundation. I hear only good things about it. When you try it I would like to hear your impressions about it.